a pocket sized pooch with a giant sized presence! 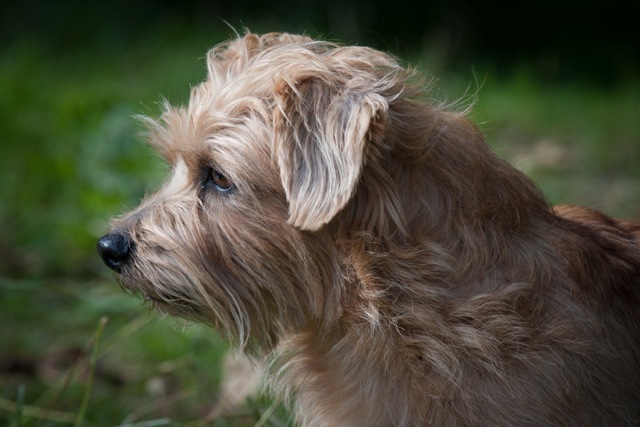 As an owner and hobby breeder I am well qualified to sing the praises of the charming little Norfolk Terrier. Do not be fooled by its diminutive stature, the Norfolk is courageous and loyal with bags of personality and individual style; a giant sized canine in pocket pooch form. This little bundle of beauty is loving, gentle and easily managed with the spirit and presence of a terrier in bite sized chunks. Not overly yappy and traditionally bred to work in groups they are super sociable with other dogs and happy to muddle along in a family of almost any combination of people and pets (and I should know). Difficult to breed and even more difficult to find, this is no run of the mill pooch. It took me over a year to get into the breed club and I’ve been keeping these for 10! Definitely one for the canine connoisseur.